Migraines are intense, sometimes debilitating headaches. It is an inherited tendency to have headaches with sensory disturbance. Migraine can be segmented into two major types as migraine with aura and migraine without aura and is more common in women than men due to frequent hormonal changes. Migraine is characterized by recurrent attacks of moderate to severe headaches along with other nervous system symptoms and that instability can become influenced by physiological changes like sleep, exercise and hunger. Apart from this other symptom includes disturbed vision, sensitivity to light, sound and smells, feeling sick and vomiting. This report is focused on identifying market size for anti-migraine drugs globally. Increasing instances of migraine related cases globally is one of the major drivers for the growth of the anti-migraine drugs coupled with increasing R&D activities and penetration of medical facilities to large part of global population. This report identifies the anti-migraine drugs market size in for the year 2014-2016, and forecast of the same for year 2021. It also highlights the potential growth opportunities in the coming years, while also reviewing the market drivers, restraints, growth indicators, challenges, market dynamics, competitive landscape, and other key aspects with respect to anti-migraine drugs market. 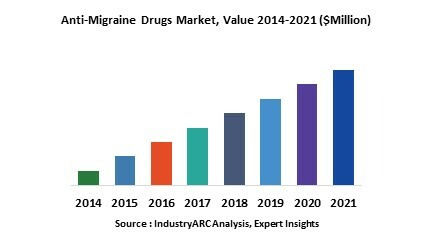 Globally North America dominated market for anti-migraine drugs in 2015 due to higher awareness about migraine and its effects and is estimated to continue the same during the period of study. North America was followed by Europe and Asia-Pacific as the second and third largest markets respective in 2015. Demand for anti-migraine drugs in the Asia-Pacific region is estimated to be grow fastest during the period of study and is expected to be driven by growing awareness about migraine in the region. This report on global anti-migraine drugs also covers different classes of anti-migraine drugs available and market size in various geographical regions. This is report has been further segmented into major regions, which includes detailed analysis of each region such as North America, Europe, Asia-Pacific (APAC) and Rest of the World (RoW) covering all the major country level markets for anti-migraine drugs in each of the region.